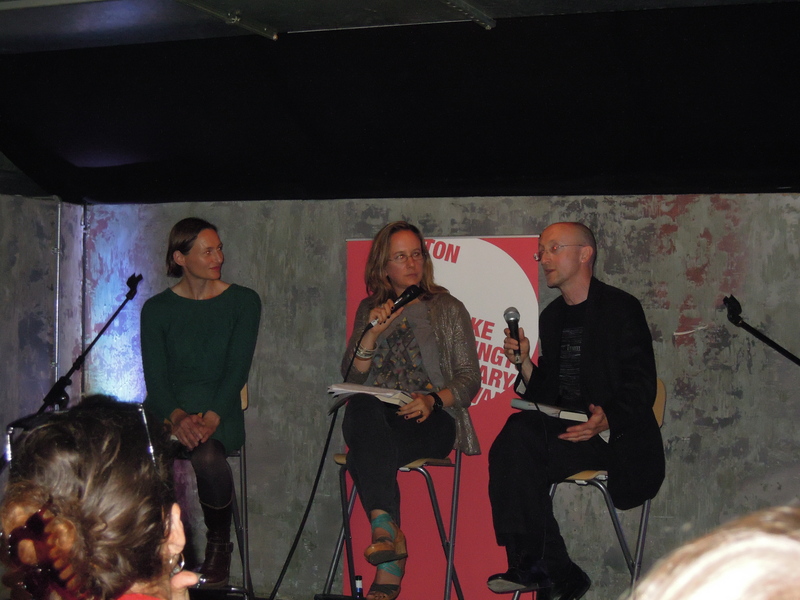 I was very privileged to be part of the Stoke Newington Literary Festival this year. The weekend has flown by in a fuzz of sunshine, laughter and applause; dodging the crowds of happy people up and down Church Street and hanging out to music and beer at the Budvar tent. Every event I went to was well attended and had its own unique vibe – mostly collaborative, often funny, sometimes emotional. The weekend started with the enigmatic Elif Shafak in conversation with Clare Armistead. Shafak was intellectually rigorous, but also sensual in her talk of spiritualism and honest about her experience of maternity. I was struck by how much the audience expected answers from her regarding the current political situation in Turkey, and what a responsibility it is for a novelist to have this role. But she dealt with the questions with grace. In the run up to the festival, my friend Emily Brett and I held creative writing workshops to involve the Kurdish and Turkish communities of Hackney, and we presented our results at the beginning of Shafak’s event. All the girls who we taught at Stoke Newington School were in the audience and we had readings from Mehmet Aksoy and Aladdin Sinayic. Mehmet’s piece, A Story in Three Languages, was about the emotional loss of a language; while Aladdin wrote and read in his mother tongue, Kurdish, about a young guerrilla being reunited with his mother and meeting his fate alongside her. Both readings were very powerful. On Saturday, I chaired a conversation between novelists Nicholas Royle and Alison Moore. Alison Moore was shortlisted for the Man Booker Prize last year with THE LIGHTHOUSE, and Royle was her editor. It was a fascinating discussion about their novels, but also their relationship as writer and editor, and the role the editor has in publishing today. I came away feeling Royle really is an exceptional wordsmith – producing accomplished and complex works, such as his current novel, FIRST NOVEL (which is actually his seventh), while working closely with various authors as not only editor but also agent, and still managing his creative writing lecturing role at Manchester Metropolitan University. I worked with Royle at ‘Time Out Guides’ for many years and still remember seeing him most mornings stepping out of the lift (from which my desk faced) with his head buried in a book, not even looking up as he made his way to his desk. I imagined that he must have nurtured a particular skill of finding his way around London – off the tube train, onto the escalator, negotiating Tottenham Court Road in rush hour – without once raising his eyes to check where he is going. On Sunday I popped into the Caitlin Moran and Suzanne Moore event at the Town Hall, which was packed with excitable women. I couldn’t stay the whole hour as I had my own event to attend at Clissold House, but was there long enough to enjoy the vibe and see how impressive Moran was before an audience. I liked that she approached writing her first book, HOW TO BE A WOMAN, as a personal exploration of feminism, not overly concerned with theory and academia. No doubt this is why she is such a success, as she doesn’t pretend to be anything other than what she is: a natural extrovert with a great sense of humour. There was also a good rapport between her and Moore. My event was a kind of ‘relative values’ with my mum, biographer Jane Dunn, whose most recent book is the acclaimed DAPHNE DU MAURIER AND HER SISTERS. I spoke about the story behind my first novel, SHADOWING THE SUN, and the inspiration for my second, THE GROWING YEAR, and did a short reading. The conversation got onto charismatic fathers, the feminism of labour and our reasons for choosing biography, in my mum’s case, and fiction in mine. Even though our work is very different, our host, Gareth Evans, helped us see the similar threads, and the result was an intimate and emotional event, so warm that at the end the brilliant Gareth suggested we all have a group hug. Thank you to Stoke Newington Literary Festival for inviting me to be involved this year. I loved every minute of it. This entry was posted in Festivals, Fiction, Literary festivals, Writing and tagged Aladdin Aksoy, Aladdin Sinayic, Alison Moore, Caitlin Moran, Clare Armistead, Daphne du Maurier and her sisters, Elif Shafak, Emily Brett, Feminism, First Novel, Gareth Evans, How to be a woman, Jane Dunn, Kurdish, Man Booker Prize, motherhood, Nicholas Royle, parenting, relative values, Shadowing the Sun, Stoke Newington Literary Festival, The Growing Year, The Lighthouse, Time Out Guides. Bookmark the permalink. This sounds like it was a fabulous event. I would have so loved to have come along, and especially to hear you reading from your second novel. I really liked reading about the creative writing workshops you held for the Kurdish and Turkish communities. I like Stoke Newington – I used to live near that neck of the woods. Thanks Older Mum. It was great fun. And the festival definitely has a very unique vibe. I’d love to be involved with it again.